Hundru Falls: Ranchi is nature's bounty to mother India which has specially been adorned with falls and streams. Hundru falls is about 28 km. aways from Ranchi town. The Swarnarekha river falls from a height of 320 feet making a wonderful scene known as Hundru falls. During rainy season it takes a formidable form but in summer it turns into an exciting picnic spot . The rich forestland of the Chota Nagpur plateau, including Hazaribagh National Park and Palamau Tiger Reserve are areas where you can easily spot elephants, tigers, leopards and sloth bears. Another popular national park is the Betla National park, rich in forest area, hills and valleys. Parasnath is the holiest place in Jharkhand, where hundreds of devotes throng every day. The Baidyanath Dham complex of Deoghar comprises of temples, which forms an important place of worship. The state of Jharkhand is rich in culture and tradition; there are about 30 communities that exist in the region. Some of the major tribes are Santhals, Oraons, Mundas, Kharias, Hos and Cheros. The State has hotels of star and non-star category catering to the needs of the tourists visiting Jharkhand. There are a number of luxurious hotels and inns in Jharkhand that provide almost all-modern facility for comfortable stay. The state of Jharkhand is a popular tourist destination with the city of Ranchi as its capital. The other tourist places in Jharkhand include Jamshedpur, Dhanbad, Hazaribagh, Betla, Deoghar, Dumka, Giridih, Netarhat and Saranda. 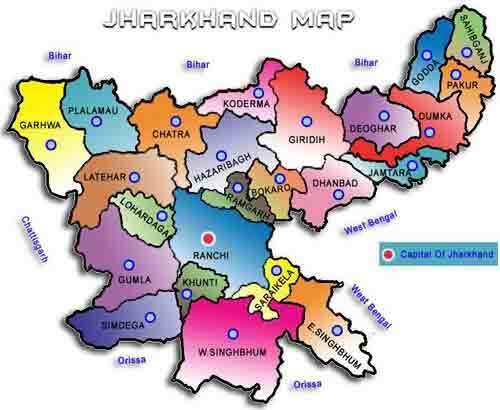 Jharkhand is a state of Mines and Minerals, industries, Wildlife Sanctuaries and Forestaries. It is mostly a tribal area. Nearly eighty percent of the population of the state are tribes. Sarhul is the most famous festival among the tribes. With its capital city Ranchi, Mines are located near the Dhanbad city, Minerals are in Chhotanagpur, Wildlife in Hazaribagh, industries in Jamshedpur and Bokaro. Deoghar is a well known Hindu Pilgrimage center. One of the Dwadash Jyotirlinga is situated here.